Today, our shop in King Street, Newtown continues to provide the tranquil oasis and friendly service upon which we have built our reputation. Our range is always evolving with new titles and gifts coming in weekly. We have made many friends through our street presence and are happy to say that our move from a warehouse in the back streets of Newtown to the main drag has been not just a step but a leap forward in providing customers with a positive and meaningful buying experience. Book guru, a fountain of knowledge, who comes out from out the back from time to time. He loves talking to people and is passionate about having quality Dharma books made available. Being one of the original business founders, who an ear for music! The one with the big smile and creative flare. She can make the ordinary look extra ordinary. 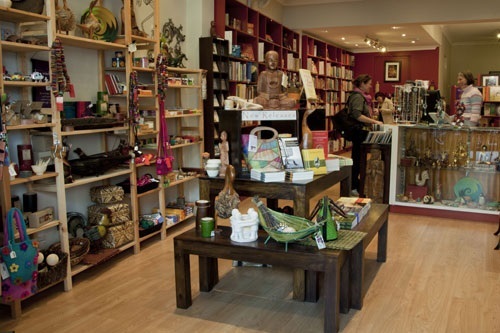 She has a strong interest in the Dharma, and finding you the right book, or gift. Motivated in sharing the stories behind the gifts, so that you can connect with the artisan. She loves the sense of community that has built up with our regular customers. Friendly, and interested in helping you to find the right gift, or book. Deeply values providing friendly and helpful service to you. Her interest in the Dharma, and strong desire to alleviate the suffering in the world, means she is passionate about working at Bodhi. Oh, in case you didn’t know, she loves Cats!